When I bought this laptop in late 2015, first thing I stopped using was touchpad. It would randomly stop moving the cursor, not register clicks, just get stuck for apparently no reason and in general work erratically. Shrugging it off as typical modern garbage (there hasn't been a laptop in last 10+ years that I used where touchpad wasn't completely awful), I got an external Logitech mouse and stopped caring. Recently decided to try and figure it out as I've been traveling a lot and using external mouse while sitting at airport or while driving is extremely annoying. So after some Google searches, it seems that this is a very common problem on this machine - there are literally thousands of posts all over bitching about the problem, having to send laptop back to Toshiba for repair - and it coming back with the problem still present. Great. Then I came across this thread on tomsguide, which pointed out that there was about 20-25 Ohm resistance between system ground and touchpad ground. From the pics and discussion, it appears the conductive tape which was supposed to bridge touchpad ground with the rest of the system was either not conductive enough, or the glue used was not conductive - resulting in quite a resistive path. Touchpads, their nature being based on capacitance between finger / pad / ground, do not work very well in such conditions. To get inside the laptop is quite simple. There's around 10 screws on the bottom, shown here by laptopmedia. Once those are out, carefully snap apart plastic clips near the bottom, loosening the back shell. See the laptopmedia link for pics - its pretty simple. After the back shell is gone, the battery is screwed in place by 5 screws. For some reason, #1 screw on mine was not there. Underpaid factory worker forgot to put it in? Anyway, unscrew those in order and the battery comes right off. There's a ~7 pin battery connector on the right side, the battery can be pulled out and put away for the time being to avoid shorting something. Next, having seen some of the repair pics on the thread, I decided to find a better solution. Since I needed to remove the battery to access touchpad, I decided running a wire under the battery was not a good idea. Instead, I noticed there was a nice ground pad on the left side, next to SSD (top-most circle in the picture). I used some 24AWG flexible silicone wire to do the job. 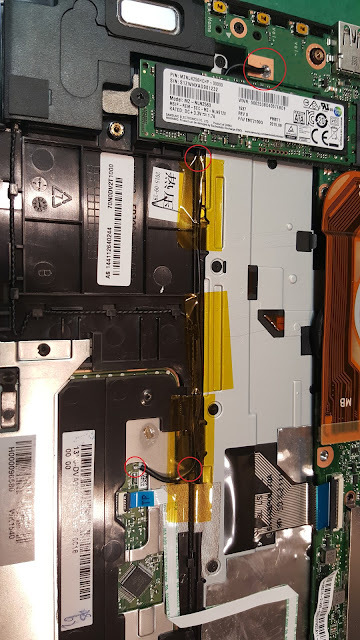 Feed the wire under the SSD, then make a small notch in the plastic in the 2nd circled area - this will allow the wire to be flat with the battery surface later on. I used kapton tape (yellow stuff in the pic) to fix the wire in place, while routing it between grooves in the plastic. Near the 3rd circle, I just bent the wire and fixed it in place with more kapton tape. Finally, the ground attachment on touchpad PCB itself - the 4th and final circle - was to a pad labeled "3", which was connected to ground pour on the PCB. For some reason, measuring resistance between that point, the gold ring around touchpad (visible through the plastic around the touchpad perimeter, and the metal frame surrounding the touchpad was still around 23 Ohm - which makes me think there was another blob of half-conducting tape below the plastic. So instead of soldering to the metal frame (you can see my 1st attempt near the final circle), I decided to solder it to the "3" ground pad directly on PCB. That was easy, I closed up the laptop, and touchpad is working exactly as it should be, including multitouch gestures and other things I thought were just broken due to Toshiba cheaping out on some 3rd world touchpad controller or something. With the touchpad fixed - this is a great laptop - 4K 12.5" is awesome. One minor annoyance - USB-C port does NOT support DisplayPort alternate mode. A bummer if you wanna connect external 4K monitor. Thanks mate for actually noting that the '3' pad is a ground pad. This makes it a lot nicer to do! Hello. I have the same issue with the touchpad. Did you soler the wire to both the touchpad and the motherboard? So far so good, but I ended up wrapping the wire around the screw with the arrow next to the pad where you soldered because the solder wouldn't stick to the pad. Like you, the touchpad pcb ground was significantly different than that of it's case where the conductive tape was attached. Grounding the "pad labeled 3" was the trick. Thanks for the tip and I love the term StonerTronics! Many thanks to Timmy for the solution. Soldering pad 3 did the trick and did same as Mark and grounded the wire around the small screw above from pad 3. I had the same issue with the Toshiba laptop P25w-4k the touchpad was not working even after Toshiba technician changer the internal touchpad to motherboard cable. but after I found your article I showed that to the Toshiba technician and force them to make the extra grounding as per the article. AndAnownmy problem is solved the laptop is working perfectly. Thank you very much for posting this article.